San Bruno Mountain is approximately 3,600 acres and is located at the northern boundary of San Mateo County immediately south of San Francisco. It is one of the largest open spaces in an urban setting in the United States and is bordered by the cities of Brisbane, Colma, South San Francisco, San Francisco, and Daly City. It’s peak is 1,319 feet high, with expansive views of the entire Bay Area. San Bruno Mountain is one of the last remnants of a unique natural landscape that once covered the northern San Francisco Peninsula called the Franciscan fog zone. San Bruno Mountain’s topography, climate and geology come together to provide a habitat that supports an array of rare, endangered and unique species of plants and animals. It has been cited as one of the most important and threatened biodiversity sites in the world (Edward O. Wilson, The Diversity of Life, 1999.) Elizabeth McClintock (1912-2004), a botanist at the California Academy of Sciences, considered the San Bruno Mountains a “botanical treasure.” In her publication, A Flora of the San Bruno Mountains (1990, California Native Plant Society), she recorded the diversity and rich heritage of the Mountain’s plant life that resulted from its topography, climate and geography. 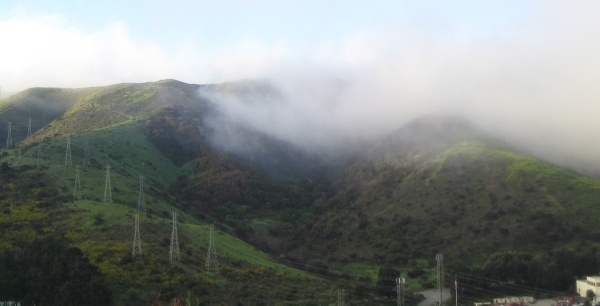 The varied topography of San Bruno Mountain, with its exposure to the Pacific Ocean on one side and the San Francisco Bay on the other, creates microclimates with dramatically different weather conditions. Fog can often be seen crawling over the ridge of the mountain heading east, especially in the summer. The drip caused by the fog can provide significant moisture for plants and animals, even in the summer when rain is rare. Other more protected areas of the mountain are more consistently sunny, and the peaks experience high winds at times. The winds are forced around the Mountain through the San Bruno Gap to the south and the Alemany Gap to the north. Plants have evolved and adapted to these microclimates over centuries, creating distinct ecosystems. For instance, areas with persistent winds often contain plants that are smaller in stature and closer to the ground for protection. Varying soil depths, and the resulting availability of moisture, also determine plant size, with smaller plants on thin soils and larger plants on deeper soils. The foundation of the San Bruno Mountain landscape began to develop more than 130 million years ago in the Cretaceous Period. What is now the California Coast was undersea during this period. For millions of years, layers of sediment were deposited in deep ocean trenches by landslides and erosion of evolving volcanic mountain ranges. The resulting sedimentary rock, called graywacke contains quartz, feldspars, and volcanic rock, as well as silt and clay. The volcanic rock fragments give graywacke its greenish-gray color. San Bruno Mountain is an elevated fault block, created by the buckling of the earth’s crust starting about 1 million years ago. The San Francisco Peninsula and Marin are composed of a series of northwest-trending earth blocks that moved relative to each other along fault lines. These earth blocks, or terranes, form part of the Franciscan Complex and each block is now known to have a unique sedimentary rock composition. Since the San Bruno Mountains are composed mostly of the Franciscan graywacke, with minor beds of shale, there is little variation in types of soil. A thin, rocky loam is found on steeper slopes and a thicker, clay loam is found on more gradual slopes. Soil depth varies considerably with the degree of the slope. Small outcroppings of serpentine are found along the Hillside Fault near Serbian Ravine, but there are no unique plant communities associated with this serpentine. One of the more unique formations on the mountain is an inland sand dune on the western slope in Daly City. This sand dune is the last vestige of a much larger Pacific Ocean that existed hundreds of thousands of years ago. The coastal prairie grasslands on San Bruno Mountain are the habitat of the three endangered butterflies and a fourth that was recently extirpated. These grasslands are some of the most diverse and intact native remnants of this community type across its remaining range. Because of the regional importance of these grassland communities, our stewardship program will focus on maintaining, restoring and expanding them. Visit our stewardship page to learn more about the grassland areas on the mountain that San Bruno Mountain Watch is active in. The habitat along the remaining perennial and seasonal creeks on San Bruno Mountain support a wide variety of native wetland plant species, including significant Willow Riparian Forests that support a diverse bird fauna. This plant community is important in providing crucial habitat for migrating birds, in particular neo-tropical migrants moving up and down the Pacific flyway. The wetlands of San Bruno Mountain still support the rare San Francisco Forktail Damselfly (Ischnura gemina) and the more common Pacific Tree Frog (Pseudacris regilla). The mountain’s wetlands once supported the threatened California Red-legged Frog (Rana draytonii) and the endangered San Francisco Garter Snake (Thamnophis sirtalis tetrataenia) and it is our hope and expectation that they will once again. Visit our stewardship page to learn more about the streams and wetlands San Bruno Mountain Watch is active in. Native Americans, generally assumed to be Ohlone (Costanoan), established the first known human settlements on and around San Bruno Mountain. 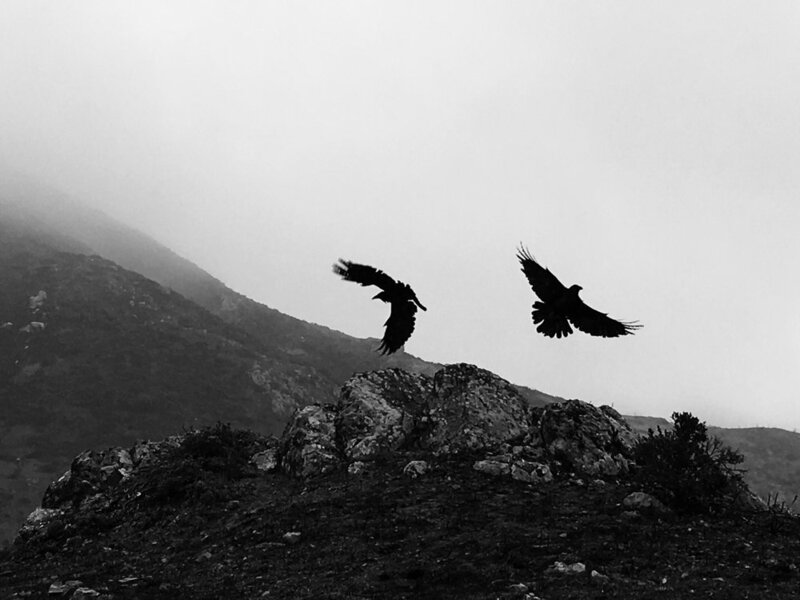 When the waters of San Francisco Bay were still at the Mountain's eastern edge, these hunters and gatherers lived in villages in the lower valleys of the Mountain. Middens, or shell mounds that date back thousands of years, are found in Buckeye Canyon, the eastern slope of the Southeast Ridge, and the inland sand dunes in Daly City - evidence of the Ohlone's presence. According to archeologists, San Bruno Mountain was first settled about 5,000 years ago and may have been the first location on the San Francisco Peninsula to be inhabited. Spanish explorers first arrived to what is now the San Francisco Peninsula in 1769. The Portola Expedition discovered San Francisco Bay from their vantage point on Sweeney Ridge in Pacifica. Spanish land grants and the Spanish mission culture soon disrupted and undermined the Ohlone social structure and way of life, and was the beginning of their decline. Brisbane a long time ago. After Mexican independence, large Spanish land grants that were once controlled by the Franciscan missions were divided up. Mexican land grants to individual settlers divided the San Francisco Peninsula. Portions of the San Bruno Mountains were once included in 5 different land grants, the largest (more than 9,000 acres) being Rancho Canada de Guadalupe la Visitacion y Rodeo Viejo. This grant, made in 1837, included most of San Bruno Mountain and what is now Brisbane and Visitacion Valley. Visitacion City, now Brisbane, grew on the north slope of the Southeast Ridge during the first half of the 20th century. Crocker Industrial Park opened in 1959 in Guadalupe Valley, once a wetland until it was filled in for development. In 1961, Brisbane incorporated as a city to deter urban renewal plans proposed by San Mateo County. The continuing threat of development sparked public interest in saving this open space and preserving the land’s natural state. In 1972 San Mateo County voters approved funds for the acquisition of lands and a development program for the creation of San Mateo County Parks. San Bruno Mountain was considered of the highest importance because of its scenic, recreational and - most important - its biological resources. In 1976 the Mission Blue and San Bruno Elfin butterflies were listed as federally endangered species under the Endangered Species Act of 1973. In 1978 the Crocker Land Company settled litigation with San Mateo County by selling 1,110 acres and donating 546 acres to the County, thereby creating the foundation of San Bruno Mountain County Park. In 1980 the State of California acquired the Mountain’s Saddle area (256 acres) as part of the State Park System. These protected lands have been merged and are now in San Bruno Mountain State and County Park. Of the Mountain’s 3400 acres of open space, the protected lands (and dedicated lands) total approximately 2600 acres and include the San Bruno Mountain Ecological Reserve, managed by the California Department of Fish and Game, made up of portions of Buckeye and Owl Canyons. Battles surrounding development on the Mountain’s privately held land that threatened the endangered Mission Blue butterfly resulted in the creation of the first Habitat Conservation Plan (HCP) in the United States. The Habitat Conservation Plan was an attempt to balance species protection with development interests. The resulting compromise between private landowners, government agencies and some conservationists was a plan to manage endangered species on private property in exchange for the right to develop on critical habitat. In 1982 an amendment to the Endangered Species Act (Section 10(a) authorized the HCP process and the “taking” of endangered species and their habitat providing that other suitable habitat was restored and maintained. HCPs have proliferated since 1982 -there are hundreds of them nationwide - and remain controversial. Many conservationists consider HCPs a failure and an inadequate tool for endangered species protection. San Bruno Mountain Watch has opposed the HCP concept and has continually fought to overturn its consequences on endangered species habitat on the mountain, successfully forestalling or decreasing the size of development in some cases. In 2003, and again in 2009, we successfully used the Clean Water Act to challenge environmental damage around the mountain. For more history, visit the first-hand account written by David Schooley, the founder of San Bruno Mountain Watch.